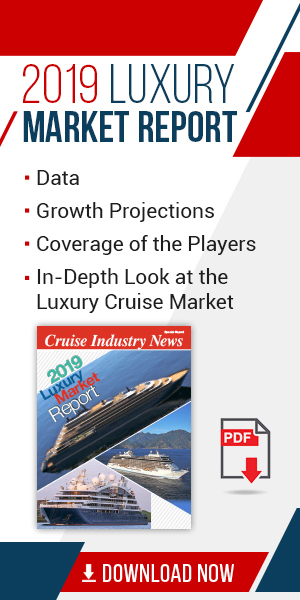 The new 2019 Cruise Industry News Annual Report is available to pre-order at discounted prices. The 32nd edition of the 400-page report will be released in February, the earliest release date ever. The report is the only information resource of its kind -- presenting the entire worldwide cruise industry in 400 pages. The 400-page report covers everything from new ships on order to supply-and-demand scenarios from 1987 through 2027+. The table of the contents is pictured to the left. Plus there is a future outlook through 2027, completely independent cruise industry statistics, growth projections for each cruise line, cruise industry market reports, and detailed ship deployment by region and market, covering all the cruise lines. Bought by banks, financial analysts, cruise lines, ports, suppliers in planning budgets and key industry stakeholders for future forecasting. There is also a comprehensive directory of cruise lines as well as their key executives, as well as detailed information on port traffic and more with historical data exclusive to Cruise Industry News' 30+ years in the business. If you are looking for a complete past, present and future global briefing on the cruise industry, look no further. All this and more for $995 in the United States; $1049 to all international destinations.